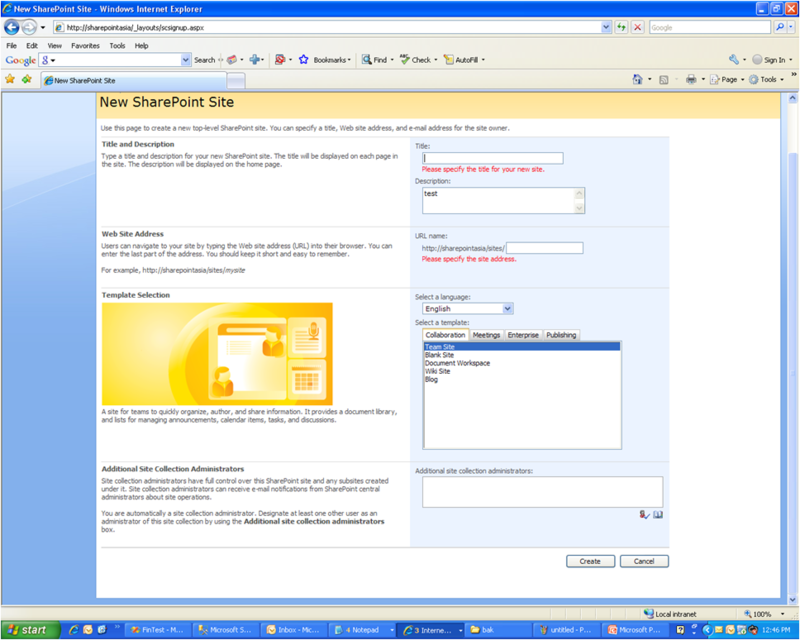 ¨Microsoft in its intranet environment gives teams a chance to explore SharePoint and we can create our own SharePoint site by going to ” ,http://sharepoint then select Asia/ South pacific. 1. Before clicking on save or create button to create a new site select the template as TEAM SITE. 2. Then select an additional site collection administrator by providing microsoft email alias of another user, who can have full control to the site, apart from the user who is creating the site. 3. Click on create button. A SharePoint Team Site is nothing but a dynamic website which helps in managing projects or teams. 2. Can be used to assign tasks to the team members. 3. Can be used to plan meetings and events in the project using calendar. 4. Can be used as a discussion board giving team members an open forum to discuss their ideas. 1. Can Plan tasks of the team. 2. Can review the document or artifact submitted by the team. 3. Can do Announcements for the team. 4. Can send mails to team for meetings. 5. Central repository for all the artifacts thus help in managing project related documents. 1. Can submit the document, work for review. 2. Multiple team members can work on excel sheet and other documents at the same time. 3. Can share ideas, pictures, blogs with the team. 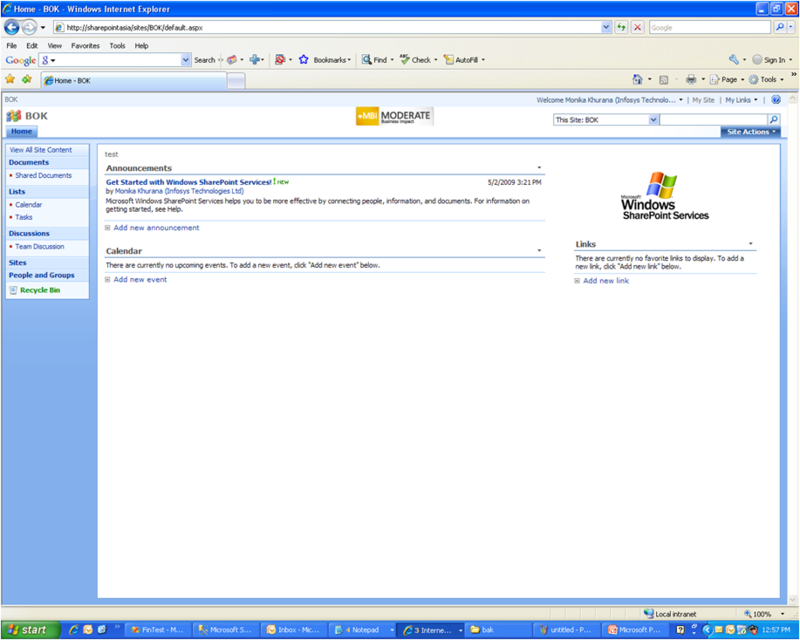 Windows Sharepoint Services 3.0 is enhanced and designed in order to deliver increased productivity by connecting people, documents and information. And also concentrates on getting more work done through sharing ideas and organize information in a better manner. •	Windows Sharepoint services 3.0 has improved UI with enhanced views and menus which helps in easy navigation of within the application and to the environment connected to the application. This feature reduces the cost involved in training resources newly introduced to the application. •	Windows Sharepoint services 3.0 is provided with Large list-indexing and cross list-indexing, these used along with specific list column properties will increase the capacity and performance and also creates a rich storage model. •	Windows Sharepoint Services 3.0 provides custom field types, which could be added as required and recurring events generated in calendars are enhanced. •	Effective easy to use collaborative tools like creation of work spaces, coordinating with calendars, communication portals, wikis and blogs, effective way of organizing documents and efficient offline synchronizing capabilities. •	Easy document management, content recovery and enhanced security features enable to create users and groups with more sophisticated controls. •	Windows Sharepoint services 3.0 provide item level security which ensures more security to the company resources. Windows Sharepoint Services uses standard windows/ASP.Net form/Web SSO authentication methods appropriately. Then the user is checked whether is authorized or not and allowed UI is visible/actionable to the user depending on the access control. This is called UI trimming. This feature helps in reduced webpage clutter and also supports easy navigation. •	Windows Sharepoint services 3.0 provide enhanced features of foundation for development and customization of web based applications and the built on applications. •	A Windows Sharepoint service 3.0 has enhanced content storage allowing more types of content to be stored and data integrity features. Windows Sharepoint Services is one of the components of Microsoft windows Server 2003. It is an efficient and powerful tool to manage documents, provide efficient collaboration environments, Content publishing and for organizing information. Windows Sharepoint Services and Sharepoint Portal Server 2003 together is termed as Microsoft Sharepoint products and Technologies. WSS 3.0 architecture is designed in a way to provide scalability and reliability. Its logical architecture comprises of front end web servers, search server and a data base server. Some of the logical components are IIS application pools, web applications, content databases, site collections, sites, Host names site collections, server farms etc. These could be physically arranged as per the requirement.These components could be arranged in different ways depending on the evaluated tradeoffs and the sharing and isolation goals. 1. WSS could be used by any business unit of any size in order to increase the efficiency and productivity. It helps people stay connected and access the necessary information with an ease across the geographic boundaries. 2. It puts up the foundation to the web based business applications and also provides robust administrative controls for storage management. 3. The web infrastructure is designed to give a cost-effective and collaborative environment with high-performance. WSS provide the ease and flex to adapt to the changing business and technical needs. WSS are basically parts of web built into a webpage which can be accessed thorough browser. Windows Sharepoint services can be used effectively in association with Microsoft Outlook, Excel, Access, Infopath etc. B. SQL Back-End servers of data feeding Web Front-End servers that render content. C. Many complex technologies working together to create powerful, but easy to use tools. B. SharePoint involves many complex technologies (SQL, IIS, and Office Client), it is designed to be easy-to-use and easy-to- understand.